If you are a side sleeper, it is surely common for you to wake up in the morning with an aching body. This is basically because of the pressure on the side of your body resulting from your sleeping position. The good thing is that it does not have to be a burden you have to carry for the rest of your life. With the use of the best pillow for side sleeper, the problem can be addressed. With this, one of the options that can be taken into account is Sleep Joy ViscoFresh Memory Foam Advanced Contour Pillow. Neck Bolster: This is one of the unique features of this model, providing it with an edge above others. It cradles the neck and the chin, which provides the support that your body needs. Another thing that is impressive about this product is its ability to reduce snoring. ViscoFresh Memory Foam: The quality of the memory foam that is used in this pillow is notable. It is moldable and hence, it will follow the shape of your head. Therefore, if you sleep on your side, it can create a contoured frame to support your face, which is necessary for your comfort. Infused with Natural Green Tea: This is one feature that you do not normally see in other pillows within the market. The green tea infusion in the foam is beneficial because it can eliminate foul odor. It can also provide a subtle scent that can put you to sleep quicker. Nano-Tex Coolest Comfort Cover: This is another notable technology that is integrated into this product. The main role of the latter is to provide the body with the optimal temperature regardless of the conditions of the external environment. Therapeutic: From the overall design and construction of this product, it can be easily said that it is not just an ordinary pillow. It is created in such a way that it can be able to deliver a wide array of therapeutic benefits. Long-lasting: The manufacturer proudly states that the pillow is made in the U.S.A. and with the use of nothing but premium materials. As supported by the opinions of other users, this is indeed an excellent choice when it comes to durability. Even through the years, it will not shrink or go flat. Reduces Snoring: This pillow can improve the quality of sleep not only through minimizing body pain that results from sleeping on your side but also through helping reduce snoring. Musty Smell: When the product is new, you will be able to smell a musty odor from the pillow. This is going to last for a couple of days. Some users find this annoying. However, there is no need to worry as the manufacturer assures that this odor will be gone within a few days. 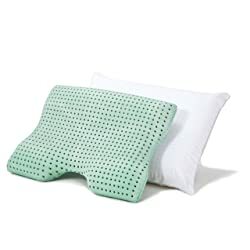 Mint Scent: The green tea scent of the memory foam pillow is loved by many. However, for some people, it is overpowering and it can make you smell like mint. Looking at the best pillows for side sleepers reviews, you will see that Sleep Joy ViscoFresh Memory Foam Advanced Contour Pillow is indeed one of the most recommended. It is therapeutic and can regulate body temperature, allowing it to provide the highest level of comfort. It is also effective regarding reducing snoring. If there is a significant problem, however, it would be the green tea infusion in the foam. Some people found the smell to be a bit dominating.